The word ‘khayal’ literally means ‘thought’ or ‘imagination’. Ejaz-e-Khusravi contains several references to this term. However, little inference can be made as to how such Khayals were performed in that era. Certainly, it cannot bear a close resemblance to today’s iteration. 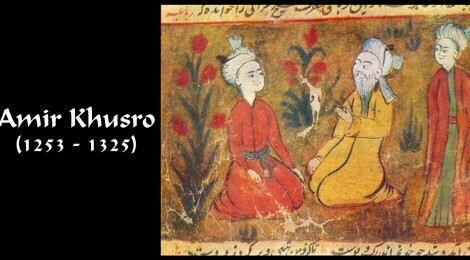 The noted Persian scholar Shahab Sarmadee has put forward the conjecture that Khusro used the term in a more general sense, that is to say, in its literal meaning rather than as a reference to a musical form. (quoted in Miner 1993: 19) Others have speculated that in Khusro’s time Khayals and Qawwalis used to be sung together, and only later did Khayals acquire the status of classical music. Nevertheless, several musicians sing Khayal compositions whose words as well as music they attribute to Khusro. A prominent example is ‘Piya Navelara Paya’, a composition in Raga Poorvi. Modern scholars, however, are quick to dismiss this story as an urban legend. One reason for this is that the Raga Kadambak is such a complex composition that assimilating its intricacies merely by listening is virtually impossible. (Mishra 1990: 16-17) At the same time, especially given the significance of such apparently meaningless syllables to Sufi practices, and given also the structure of the Qaul and the Qalbana, we may safely contend that Khusro did indeed play a significant role in the ultimate emergence of the Tarana as we know it. The last eight hundred years have done much to erode Amir Khusro’s contributions to music. This is so much so that today we have no way of distinguishing his own work from later interpolations in his name. Hence, unlike in the field of literature, for instance, as a musician Khusro continues to remain an indistinct, even legendary figure. Nevertheless, throughout these years, he has been a source of inspiration to musicians. Many have attributed their own creations to him. Some have sought to revive obscure Ragas traditionally ascribed to him. Then again, the manner in which people have sought to incorporate his poetry into contemporary musical forms makes for a fascinating study. The composition Hazrat Khwaja Sang Kheliye Dhamaal is a classic example. For centuries, Qawwali and Khayal exponents have presented this in their own respective styles. Traditionally, it is associated with Raga Bahar. Rubaaidar Taranas are a special type of Tarana, where the second stanza incorporates a Persian couplet or quatrain instead of the usual mystical syllables. Some feature a few lines of Urdu, Hindi or even Sanskrit. Many musicians of the present era, notably Ustad Amir Khan, have used Khusro’s Persian poetry for their Rubaaidar Taranas. For if you arrive after I am dead, your coming shall be pointless. ‘Early Sufis in the Chishti Order’, available online at: http://www.chishti.ru/order_of_sufis.htm. ‘Khwaja Gharib Nawaz’, available online at: http://www.chishti.ru/o_gharib_nawaz.htm. ‘Khwaja Moinuddin Hasan Chishti’, available online at: http://www.chishti.ru/order_of_sufis.htm. Bhatkhande, VN (1990 reprint) Leading Music Sytems of the 15th, 16th, 17th, & 18th Centuries, Delhi. Das, RK (2004) Ameer Khusro – the Great Indian, Delhi. Miner, Allyn (1993) Sitar and Sarod in the 18th and 19th Centuries, Delhi. Mishra, Susheela (1990) Some Immortals of Hindustani Music, Delhi. Willard, NA (1834) A Treatise on the Music of Hindoostan, Calcutta.